We specialize in naturally leavened sourdough breads with deep flavor and hearty crusts. Our rotating selection includes favorites such as basic sourdough boules, cheddar scallion, seed bread, millet bread, and malt rye. 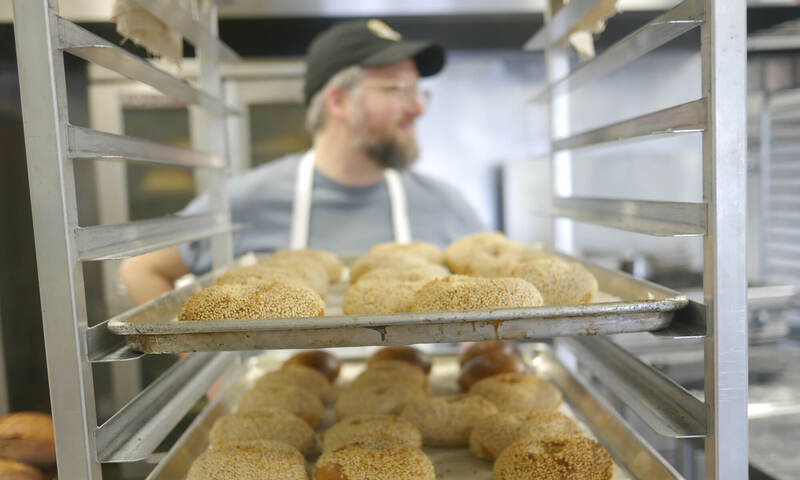 Our bagels are truly a labor of love. They are naturally leavened, hand-shaped, long-risen, boiled in malted water and baked in a hot oven for the perfect flavor and texture. If you’re unfamiliar with bialys, they are chewy like a bagel but more open, like an English muffin. The indentation in the center is smeared with roasted onions. If you are familiar with bialys, you know how delicious they are, and are probably very excited to see them available in Minneapolis. New for the 2019 farmers market season, Asa’s Bakery is making sandwiches highlighting our breads, bagels, house-made cream cheese, spreads and the market’s amazing seasonal produce. We plan to return to the Midtown Farmers Market for the 2019 season with expanded offerings!